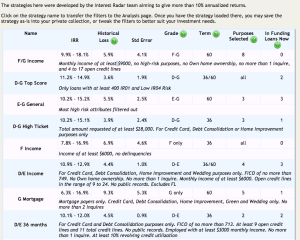 When starting investing in LendingClub many individuals choose one of of these options for getting fully invested. #2 Combing through notes based on filters and hand picking notes out. There is certainly nothing wrong with either of these options, but what if there was an easier way? I learned about both InterestRadar and P2P-Picks and decided to sign-up. Currently, InterestRadar offers a 30 day free trial, a $9.99 monthly subscription or $59.99 for a one year subscription. Alternatively, if you have less than $10,000 in your account (like me), you can email them at webmaster@interestradar.com to receive a limited-time discount. P2P-Picks is still in beta so for the time being you can sign-up and enjoy free access. Simply select the option you want to go with, choose the note size and press go. You will want to make sure you are logged into LendingClub so the notes can appropriately to your oder. Simply click on the strategy you are interested in (provided there are available loans) and you will be taken to a screen where the notes are listed. From here you can view some of the details and invest in the notes if you are interested. One of my favorite columns is the LC Hype/IR Hype which allows you to get an idea of the popularity of a note. If you don’t see notes in the desired strategy, try looking just after 6 AM, 10 AM, 2 PM and 6PM Pacific Time. There is much more available with InterestRadar, but this should at least get started. 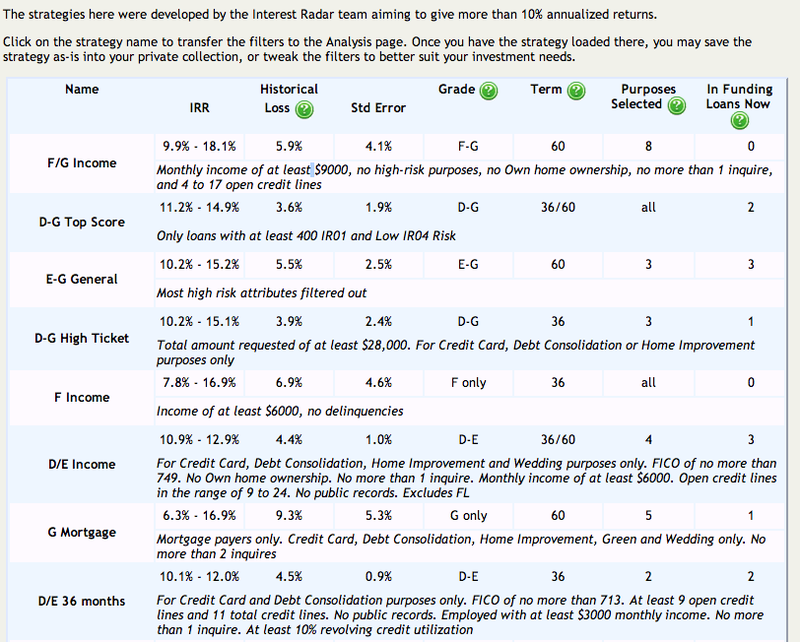 I currently use both of these tools to find loans, but then I review them individually before actually invested. I have 2 separate portfolios setup for each product so I will be sure to keep the results up to date. What is your favorite tool or favorite feature of a particular tool? Interested in us featuring your third party tool? Contact us!